← Condemn the Government’s Warmongering! British workers are looking on with great internationalist interest as to what is going on in France with French workers engaged in their mammoth struggles for social justice and rights these days. What happens across Europe also holds our attention and has been heightened by the results of the EU referendum in Britain as the contending and colluding powers try and resolve problems in their favour. Macron, the French President, for instance is organising his “great neo-liberal reforms” programme, it seems on behalf of the European monopolies. This is in the form of an offensive against the French working class to increase austerity and productivity drives against the French working class, a proud and courageous contingent of the international organised working class. In this effort the British workers extend their solidarity to our comrades in struggle and wish them success. It is no accident that this new confrontation is taking place marking new battle lines in the struggle of the classes. It is reminiscent of the great revolutionary struggles in France that the British bourgeoisie have always tried to keep secret or brush under the carpet. They have always said that this is not our way, “the French are the French, they always do things differently”. We all know the traditions of the French workers, but we also know that we are no longer in thrall to the traditions’ chains of the British ruling class either and the British workers will no longer be bound by them. Recent history has shown the significant contribution made to international social progress by the French workers. In 1936, around six million workers blocked and occupied factories, leading to significant wage rises and the advent of annual paid leave. The year 1968 saw France’s largest modern social movement when some nine million striking workers obtained a 35 percent increase in the minimum wage and the legalisation of union representation within companies. It also is no accident that the latest upsurge of French workers’ struggles is reminiscent of the memory among many of the Paris uprising of 1968, which had its effect throughout Europe and the world. The 50th anniversary takes place in May this year. Then, demonstrations and massive general strikes, as well as the occupation of universities and factories, took place across France. It began then with a series of student occupation protests against capitalism. It spread to factories with strikes involving 11 million workers, more than 22% of the total population of France at the time, for two continuous weeks. Confrontation by police and the de Gaulle regime, only served to inflame the situation, leading to street battles with the police in the Latin Quarter, followed by the spread of general strikes and occupations throughout France. De Gaulle even had to flee the country at the prospect of a revolution, to Germany. In the here and now, France 24 and Agence France Presse (AFP) reported recently that France braced itself for the start of three months of rolling rail strikes. These were the first in a series of walkouts affecting everything from energy to rubbish collection as President Emmanuel Macron’s reform agenda came up against resistance. 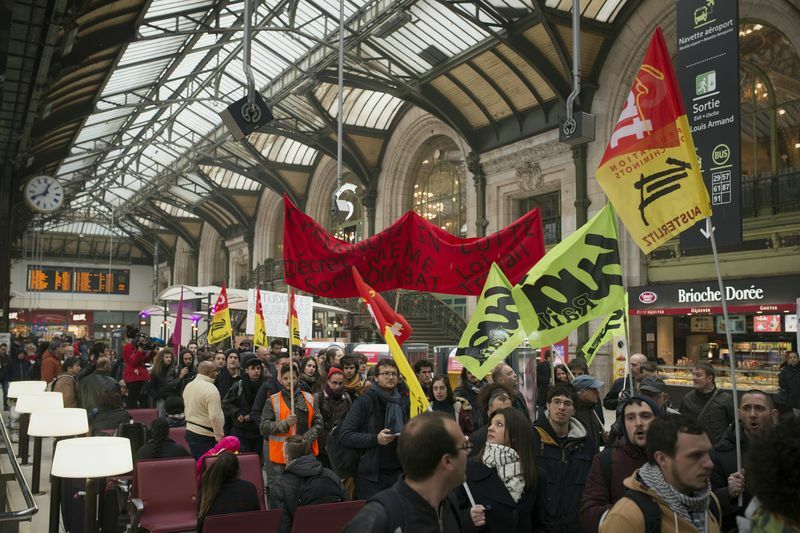 Workers at state rail operator SNCF walked off the job kicking off stoppages on two out of every five days to cause major disruption for France’s 4.5 million train passengers. The Government were intent on carrying out a major overhaul of what it called a “debt-ridden SNCF”. Trains towards Spain, Italy and Switzerland have been hit by the strike. The strike became more generalised because of actions by rubbish collectors, some staff in the energy sector and Air France employees. 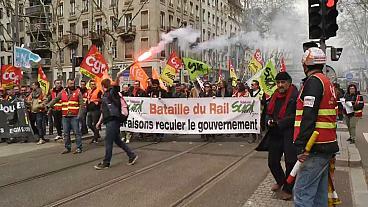 The rail strikes, set to last until June 28, are a big challenge to the neo-liberal Macron government. The intention is to increase capitalist competition and drastically increase productivity through exploitation. Unions say the centrist ex-investment banker intends to “destroy the public railways through pure ideological dogmatism”. Also they say the changes are a first step towards privatising the SNCF. They want to strip workers of their retirement dates and job security, hiring and firing at leisure. Macron has made moves to loosen protection for workers by breaking France’s labour code; he has also planned to scrap 120,000 public sector jobs. Macron and his neo-liberal cohorts are set about reversing gains made in the French workers’ struggle for rights and empowerment. In many workplaces there are workers’ councils where unions are joint managers, along with business representatives, health and social-security system representatives, and shop-floor employee representatives. In firms with over 50 staff, French law legislates that there should be union representatives on works councils and separate health-and-safety councils. These must be consulted regularly by bosses on a vast range of detailed managerial decisions. This gives trade unions a daily say in the running of companies across the private sector. The works councils’ remit ranges unusually wide. The lay-off of more than ten employees must be negotiated with works councils under a tightly regulated “social plan”. The EU model of Works Councils in essence is varied across the board, they are different in Britain, Germany and France, they have their own particular histories and mandates. French firms, who try to escape the system, often choose not to hire more than 49 employees, in order to avoid having to deal with a works council. The neo-liberals wish to reverse the entire situation of workers’ rights and empowerment in civil society by re-establishing the absolute dictatorship of monopoly property rights, excluding the workers. Philippe Martinez, head of the CGT union, has called for different forces opposed to Macron’s agenda, including pensioners and student groups, to “bring their fights together”. Students have been protesting over university admissions. According to The Independent, pilots, cabin crew and ground staff plan three two-day stoppages over the next two weeks. The strikes in France are now being referred to as “The Spring of discontent”. Air France employees are demanding a 6 per cent pay rise, while the airline is offering 1 per cent. Unions say workers deserve to benefit from years of belt-tightening that have brought the carrier back to operating profitability, after seeing their wages effectively frozen since 2011. Air France management estimated 34 percent of pilots walked out, 26 percent of crew and 19 percent of ground staff. Additional strikes were announced for 10 and 11, 17 and 18, and 23 and 24 April. Previous stoppages caused cancellations of links from Heathrow, Manchester and Edinburgh to Paris. Now is an important time for internationalism for the workers of the world and Europe. Global capitalism is waging its offensive and this being met by increasing counter-measures by the working class as it tries to turn things around. This is why British workers are looking on with great internationalist interest as to what is going on in France and all workers are looking for ways to express their commonality in struggle. The issues of big power states are everywhere showing the increase in police powers at the same time that civil authority is diminished. Workers of the world are uniting to ensure and guarantee their rights. They are looking at new ways out of their own circumstances to empower themselves. The French workers have lived under their own conditions, which are being upset by the powers that be in their country. They too are looking at the alternative to the neo-liberal agenda and offensive with new arrangements in society.